Wolf Commercial Real Estate, a premier Philadelphia commercial real estate broker that specializes in Philadelphia commercial real estate listings and services, now has available well-located Philadelphia retail space for lease at 1004-1026 Spring Garden Street Philadelphia. There are 9,020 square feet of contiguous prime retail space in Philadelphia currently available at 1004-1026 Spring Garden Street Philadelphia. This Philadelphia retail space for lease comes in two units, one of +/- 6,820 sf and the other of +/- 2,200 sf. A mezzanine floor also is available at this retail space in Philadelphia. The asking lease price for this retail space in Philadelphia is $22.50/sf NNN. This Philadelphia retail space for lease at 1004-1026 Spring Garden Street Philadelphia is available for immediate occupancy through Wolf Commercial Real Estate, a Philadelphia commercial real estate brokerage firm that specializes in Philadelphia commercial real estate listings and services. 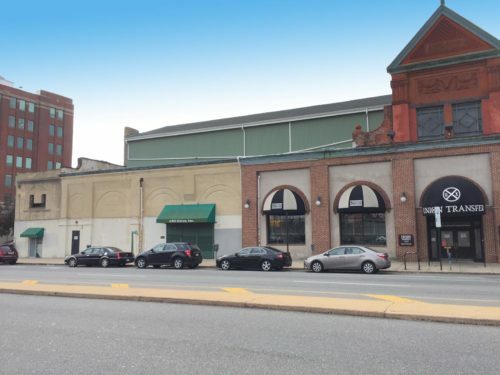 This Philadelphia retail space for lease is adjacent to the legendary Union Transfer building and there is first-floor retail, restaurant, professional space in this retail space in Philadelphia, which is near office buildings and healthcare facilities. Located in a rapidly changing area of the city, this Philadelphia retail space for lease offers high ceilings, historical architecture, and great ownership. In addition, this Philadelphia retail space for lease at 1004-1026 Spring Garden Street Philadelphia is surrounded by residential neighborhoods, and several schools are nearby. This retail space in Philadelphia features both building and monument signage and there is very strong vehicle traffic at this Philadelphia retail space for lease at 1004-1026 Spring Garden Street Philadelphia. Wolf Commercial Real Estate, a Philadelphia commercial real estate broker with expertise in Philadelphia commercial real estate listings and services, is offering this retail space in Philadelphia. More than 56,000 people reside within one mile of this retail space in Philadelphia, and the average household income within that same radius is $81,257. For more information about Philadelphia retail space or any Philadelphia commercial properties, please call Wolf Commercial Real Estate, a premier Philadelphia commercial real estate broker that specializes in Philly retail space. Wolf Commercial Real Estate, a Philadelphia commercial real estate broker that specializes in Philadelphia commercial real estate listings, provides unparalleled expertise in matching companies and individuals seeking new Philadelphia retail space with the Philadelphia commercial properties that best meets their needs. Please visit our websites for a full listing of South Jersey and Philadelphia retail space for lease or sale through our Philadelphia commercial real estate brokerage firm.